Gorgeous views of the lush Ozarks, mouth-watering food, and excellent entertainment - it's all part of the dinner cruise experiences you can have in Branson on the Showboat Branson Belle and Main Street Lake Cruises. 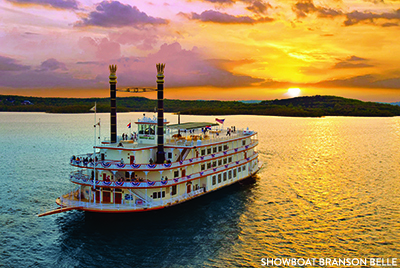 The largest ship to be built on a land-locked lake in the US, the Showboat Branson Belle cruises the tranquil waters of Table Rock Lake. The 700-passenger paddlewheel riverboat, built to recreate the magic of boats that entertained crowds in the 1880s, offers two-hour lunch and dinner cruises. Guests dine at long tables that face a large main stage, where performers entertain with music, comedy and magic for all ages. Enjoy opening acts while you are served a hearty meal of slow-simmered beef roast and honey-dijon glazed chicken served with garlic mashed potatoes, sugar snap peas and julienne carrots. Don't forget to save room for dessert - the golden brittle lemon-berry torte drizzled with caramel sauce is a delightful treat to your taste buds. A short break after the feast gives guests the opportunity to mingle with performers and explore the ship's lounges, promenades and decks to admire panoramic views of the surrounding landscape before the main show. Have you ever thought to yourself after a day of shopping, "I could really go for a cruise around Lake Taneycomo"? Main Street Marina Lake Cruises offers not one, but two lake cruises and is conveninety located at the Branson Landing. You can choose from the Lake Queen, a modern day riverboat replica, or the Landing Princess, a 100' luxury yacht. What a way to celebrate all the great shopping you've just done, right? 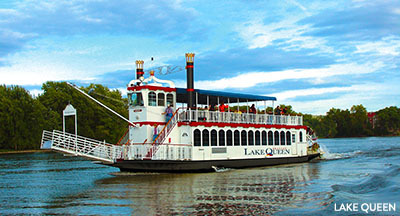 The Lake Queen cruise paddles along the shores of Lake Taneycomo as your guide explains facts and trivia of the historical and present day Branson waterfront, along with local points of interest. The top deck of the paddleboat is open and features a canopy with outdoor seating, and the bottom deck is closed in but has large panoramic viewing windows so you don't miss a thing. While this isn't a dinner cruise, you can enjoy lunch on the Lake Queen for their 11:45am sightseeing cruise. Your lunch includes a smoked ham croissant and potato salad, with water, tea or coffee. The Landing Princess offers a dinner cruise experience. Your meal includes a garden salad, 4 oz of texas beef brisket, country roasted chicken, garlic mashed potatoes, country style green beans, cornbread muffin, and bread pudding for dessert. Water, coffee, or tea is also included with this meal. The 100' luxury yacht features two climate controlled decks with windows lining each deck and three outdoor bistro seating decks. 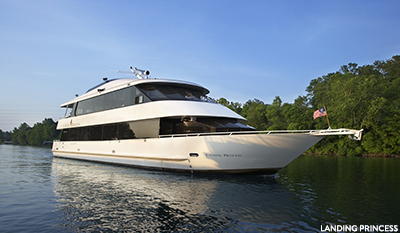 Cruise in style and enjoy a filling meal while you take in a Branson sunset on Lake Taneycomo. Now that we've made you hungry, grab your tickets for a dinner cruise in Branson! Be sure to tag your photos with #ExploreBranson on Instagram and Twitter.